Rottweilers rescues the life of a 80 years old pensioner woman ! Four Rottweiler dogs ran to the rescue a confused old woman who had been trapped in a school playing field for more than 15 hours. The dogs named, Tillie, Billy, Gerrard and May were being walked at around 1.20 am, by David Malt and Jack, his nephew. The pair often take the dogs out when the field is empty, because of public perceptions about this dogs breed aggressiveness. They found the 80 years old woman shivering and in a panicking state in a Cheltenham school playing field after their owners took them out for the walk. The four dogs noticed the presence of the old woman when they were released into Bournside School playing field by the owners. Tillie, one of the dogs licked the woman and stayed with her until her human owners caught up because they suspected the dogs had found something and went to investigate. The 80 years old woman was in danger of being stranded all night but was later taken to hospital, where she was treated. After being treated the woman told that she got off the bus at the wrong stop, had fallen and was trapped in a bush, she later thanked the owners and the dogs for their help..
Once again, you can see the true nature of Rottweilers, this dog breed does not have a great reputation, but they're really protective, and were originally bred as working dogs. That's what I'm talking about. Rottweilers #1 in my book , best dog to own in my book. Great family protector. 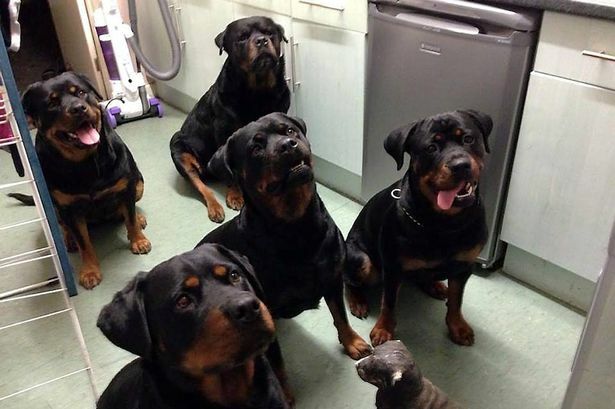 Rottweilers are wonderful dogs. My Rottweilers helped me take care of my elderly mother until the town of Hamden, Connecticut took them away and ordered them killed. They were only puppies at the time.Since October 2012 I've been fighting to get them back and stop the Town of Hamden Connecticut from killing them. Please HELP me by supporting our Facebook page and Twitter page. Thank you in advance and God bless you all.